0,565″ diameter, 16,5″ length, 3,5″ taper, small, acorn-like wood tip. The stick is longer than a regular 5A but with much more taper to enhance rebound. The “Firegrain” technology adds durability and additional strength while “Active Grip” adds grip without feeling “sticky”. The small acorn-like wood tip creates finesse and special touch on your cymbal work. Approximate weigth per pair: Around 110 – 115 gramm. 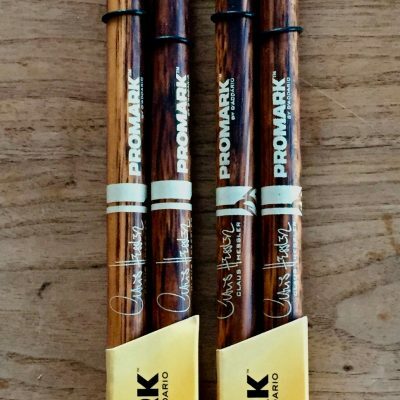 2 pairs of Claus’ signature stick with Promark; using “Firegrain” AND “Active Grip” technology. The details: 0,565″ diameter, 16,5″ length, 3,5″ taper, small, acorn-like wood tip. The stick is longer than a regular 5A but with much more taper to enhance rebound. The “Firegrain” technology adds durability and additional strength while “Active Grip” adds grip without feeling “sticky”. The small acorn-like wood tip creates finesse and special touch on your cymbal work. Approximate weigth per pair: Around 110 – 115 gramm. No extra shipping charges.